Ionized, cold-filtered whey protein isolate. 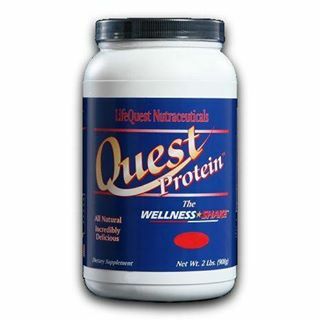 21 grams of protein per serving (high quality whey proteins, lactalbumin and alphalactoglobulin, and to a lesser degree, bovine serum albumin and immunoglobulins). Provides a full spectrum of nonessential, semi-essential, and essential amino acids. Stevia (Stevia rebaudiana bartoni leaf extract), a potent, noncaloric sweetener used worldwide (no aspartame, no lactose). Hypoallergenic - Casein, the most allergenic of milk proteins, not included. Also, no wheat, egg, soy, yeast, or chemical additives. Tasty, easy to mix. Choice of Vanilla, Chocolate, Banana, Chocolate Peanut Butter and Cinnabun. One ounce (102 calories) per serving. Convenient scoop with handle included. What Is Cold Filtered, Ionized Whey Protein? Whey protein, along with casein, one of the 2 major proteins in milk, is derived from purified cow's (or goat's) milk cheese - a complex process which includes defatting, precipitation, washing, solubilization, concentration and purification steps. Commercial ion exchange resins are also used as part of the purification process. Whey "isolate" is a standardized, higher concentrated form of protein than whey "concentrate". The cold filtered ion exchange process allows the whey protein to maintain its purest natural composition without the protein denaturation of heat. More easily and efficiently digested form of protein than food. Curbs appetite for sweets and other carbohydrates. Acts as an antioxident, preventing peroxidation of fats. Improves the viability of the probiotic bifidobacteria. Increases endurance and muscle recovery from physical activity (especially effective within 30 minutes immediately following exercise). Improves resynthesis of the body's high energy store, glycogen, by 20% or more following an intense workout. Increases metabolism (helps speed weight loss). With resistance training, results in significant weight loss, fat loss, lean body weight increase, and increased muscle strength. Improves immune function. Protects against immune function disturbance caused by oxidized cholesterol (animal study). May assist human white blood cells in fighting off certain bacterial infections. Twice as effective as highly touted soy protein anti-aging/rejuvenation benefits. Increases bone growth, density and strength. Helps prevent oxidation of the "bad" LDL cholesterol (low-density lipoprotein). When added to lactobacillus casei- and streptococcus thermophilus-enriched milk, raises "good" HDL cholesterol, lowers serum triglycerides and lowers systolic blood pressure. Branch-chained amino acids valine, leucine, and isoleucine. Non-caloric sweetener with a mild licorice-like taste that is at least 250-300% sweeter than table sugar (sucrose). Is totally safe and nontoxic (the Japanese government approved Stevioside as a sweetener and flavor enhancer for food use in Japan in 1970 after many years of intensive study. Today it is used in many countries including Japan, Israel, Brazil, China, Taiwan and Korea. In fact, Stevia and its extracts have reportedly captured over 50% of the Japanese market. Major multinational food companies convinced of its safety, use Stevia extracts to sweeten foods for sale in Japan, Brazil and other countries where it is approved. Ideal for children in that it does not contribute to dental caries. Unlike sugar, Stevia does not trigger a rise in blood sugar so often resulting in fatigue and need for another "sugar fix" later on. Unlike sugar, Stevia does not feed intestinal yeast; does not create an unhealthy imbalance of intestinal microorganisms. Due to Stevias potent glycoside sweeteners, Stevia has become an extremely popular table-top sweetening alternative in foods and beverages for diabetics and obese people. Benefits attributed by folklore to Stevia: stimulates alertness and counters fatigue; facilitates digestion and gastrointestinal functions; regulates blood glucose levels; nourishes the liver, pancreas and spleen; helps the body sustain a feeling of vitality and well-being and can be used as an external application for blemishes. It has been shown in studies to inhibit the growth and reproduction of some bacteria that are responsible for tooth decay. Some users report a decrease in desire for sweets and fatty foods. Additionally, some users have reported that drinking Stevia tea or Stevia enhanced teas helped to reduce their desire for tobacco and alcoholic beverages. The other non-caloric sweetener, Aspartame is reported to have undesirable side-effects, including seizures and brain tumors (animal studies).